Transit-oriented development that has transformed a former strip shopping center into an urban-style mixed-use community, roughly 10 miles northwest of the District of Columbia. Invested in the development project through a venture with the property’s developer, The JBG Companies. Five-story building with ground-floor retail and restaurant space developed on the site of a former 93,000-square-foot strip center that is adjacent to the Rockville Hilton on the heavily traveled Rockville Pike, 10 miles northwest of the District of Columbia. 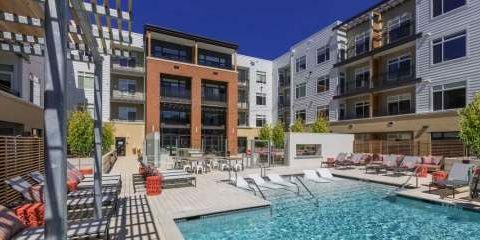 Located just 500 feet from the western entrance to the Twinbrook Metro station, which provides commuters with light-rail, public-transit access to points throughout the Washington, D.C., metropolitan area. Part of a major redevelopment effort that aims to transform 26 acres of commuter parking lots and adjacent property into a vibrant, 2.2-million-square-foot, mixed-use district surrounding the Twinbrook Metro station. 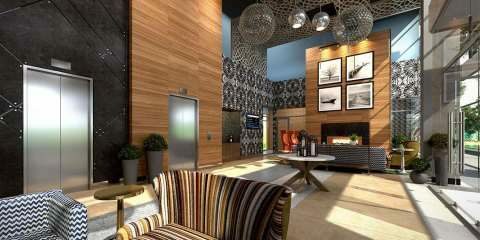 In addition to its one- and two-bedroom residences, community amenities include four landscaped courtyards; a swimming pool with a sundeck, outdoor fireplace and grilling stations; an indoor lounge with a catering kitchen and bar; on-site bike sharing; and a fitness center with an outdoor yoga area. 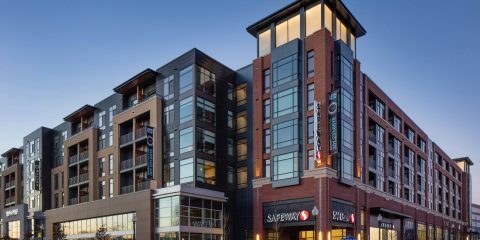 A 63,000-square-foot Safeway, with two levels of underground parking, anchors the retail component. Other retail tenants include an Ethan Allen Design Center, Dunkin Donuts and Floyd’s 99 Barbershop. Fifty-three of the apartments (15% of the total built) are designated as affordable housing for low- and moderate-income residents. Targeting LEED Silver certification, under the U.S. Green Building Council’s green-building rating system. The entire Twinbrook Station project has been designated a smart growth project by the Washington Smart Growth Alliance and has received the International Charter Award for Excellence from the Congress for New Urbanism.